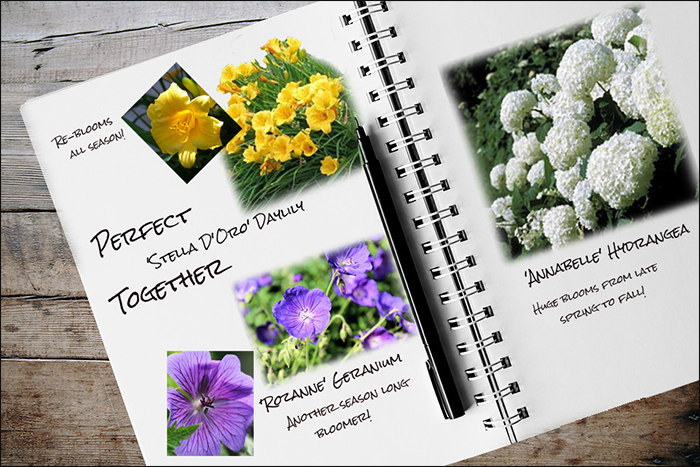 Garden Notebook – Stella, Rozanne, and Annabelle | Faddegon's Nursery, Inc.
May 9, 2017 | Garden Tips, Perennials, Shrubs, Trees & Vines, What's New? Do you want an absolutely great trio to plant and enjoy together? These garden girls, Stella, Rozanne, and Annabelle may be who you’re looking for. The three have a lot in common but are different enough to make an impressive planting. All three bloom continuously for most of the season! What do they have in common besides their beauty? A long season of blooms, easy maintenance, all enjoy similar light conditions, and all three are extremely hardy for our area. Annabelle will make a wonderful backstory for Stella and Rozanne. Interplant Stella and Rozanne with each other or place Rozanne in front. Since Stella has a vertical habit you will have a nice texture difference with Rozanne’s delicate foliage and mounding habit. A truly wonderful aspect of this group is that you can plant them in full sun or part shade so making a home for them is easy! The giant pure white blooms are 12″ across. ‘Annabelle’ is a true native plant so is exceptionally successful in our climate. This is an easy flowering shrub! A pure vibrant yellow flower that attracts butterflies. ‘Stella’ stays attractive and has a nice compact clumping habit. One of the most popular perennial flowers. ‘Rozanne’ just doesn’t disappoint blooming like crazy.